Today is Mother's Day, in case it had escaped your notice. My own mother has been gone for six years now; she died just a few weeks after her 93rd birthday. For perhaps ten years before her death, she had been sliding into dementia -- not Alzheimer's, just your garden-variety can't-remember-stuff. Still, until her death, she lived in the same house in Northern Indiana where I grew up. She even kept driving until she turned 90 (mainly because there's no bus service in our neighborhood). My brother, Lawrence, who lives in Chicago, took on the bulk of the responsibility for keeping Mom and the house going -- and kudos to Lar for that, as I am a 13-hour drive away. At some point during the final years of Mom's life, I began keeping a journal. It may never see the light of day in its entirety, for various reasons. But here's one snippet for you on this Mother's Day. The setup is this: Mom had gone to the DMV to get her driver's license renewed. She failed the eye exam, though, and then she couldn't find her old license, claiming the DMV took it. My brother convinced me to drive out to Indiana for Easter, help her get her license renewed, and get her eyes checked. I couldn't get her an eye appointment on Good Friday, so Lar insisted that I take her back to DC with me. Once she got her eyes checked, I was to put her on a plane back to Chicago. Lar would then pick her up at O'Hare and drive her the two hours back to her house. Sounds like a setup for a slapstick routine, right? It gets worse. That wheelchair was a stroke of inspiration. Because of it, the security guards allowed me to go to the gate with Mom. They did confiscate my penknife, which I’d forgotten to take off my keychain and leave in the car. I sweet-talked them into holding onto it for me until after Mom’s plane left. “Oh, that’s mine,” Mom said. “Ma’am, we’ll have to open your suitcase and take a look inside,” the screener told her. “Listerine bottles sometimes look like dumbbells on the x-ray,” he explained. Sure enough, they found nothing in Mom’s suitcase that would be fatal to anything but oral bacteria. We headed through the doorway and were immediately at the gate. “I can’t answer for you,” I said. Finally, the gate attendant announced that the plane was boarding. I wheeled Mom up to the gate. “I know,” I said with a sigh. So I rolled Mom over to the table where the secondary searches were taking place. For the second time in less than half an hour, the security guards went through Mom’s suitcase. “There’s no bomb in there,” Mom said, then clapped her hand over her mouth. “Mom!” I hissed, thinking, Jesus Christ! Fortunately, the guard had his back to us and didn’t hear her – otherwise we might still to this day be in a padded room at the airport, explaining ourselves to the FBI. Finished with her suitcase, the guard got Mom out of the wheelchair and ran the wand over her; she checked out fine, of course. One of the flight attendants escorted her onto the plane as I waved goodbye. Relieved to be out of there, I collected my penknife from the security guard outside the gate and headed home. Later that day, I called Mom to see whether everything had gone smoothly on the O’Hare end. "What flight?" she asked. "Lawrence drove me home." 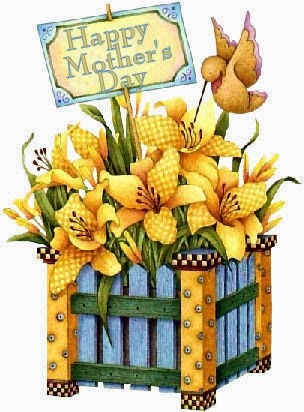 Happy Mother's Day to everyone who has ever been a mom or who has ever had a mom. And here's hoping that your day has been one to remember. These moments of memorable blogginess have been brought to you, as a public service, by Lynne Cantwell.